In a heavy saucepan heat the olive oil on medium heat. Add the onion and saute (stirring often) for 5-8 minutes until onions are translucent and soft. Add the garlic and continuously stir for another minute or two so all the flavors meld together. Add the fresh basil, fresh parsley and dried oregano and stir continuously for another minute or two until you smell the fragrant herbs (do not stop stirring!). 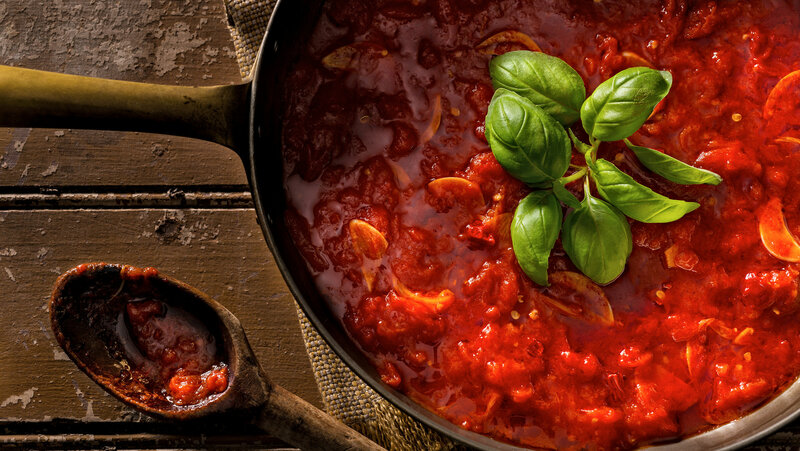 This allows the herbs to release the flavors into the sauce making it a quicker recipe than an all-day sauce. Add the two cans of crushed tomatoes, salt and pepper and stir everything so it’s nicely mixed and bring the sauce to a boil. Once the sauce boils reduce it to low heat so the sauce is simmering for about 20 minutes (this is the minimum but the sauce can simmer as long as you have time). After the twenty minutes or once you are ready to finish the sauce, add 1 Tbsp of balsamic (the secret ingredient) and stir. Give the sauce a test and if you want a little more zing add another tablespoon of the balsamic.